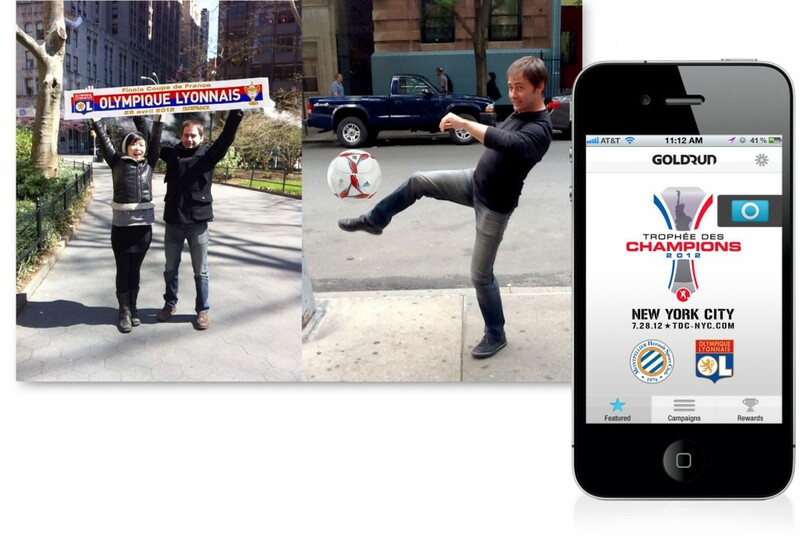 The Trophee des Champions has a new Augmented Reality App. Global Soccer fans can now Download and then Pose with the Trophee des Champions (TDC) in order to share their virtual support until the July 28th Championship Match at Red Bull Arena. One participating U.S. fan who posts via social media (let it be a Sports Techie) will win a VIP ticket package and a trip to the game in New York City. Front Row Marketing Services, The Ligue de Football Professionnel and Goldrun launched their augmented reality app giving fans around the world a chance to “interact” with the TDC and ‘strike a pose’ to the world. This is being considered the first-ever International Augmented Reality Sports App. Augmented reality is a technology that superimposes a computer-generated “virtual” image onto a user’s view of the real world, thus providing a composite view. The technology relies on a camera’s hardware to function, therefore most augmented reality applications are created using a smartphone’s or computer’s built-in camera. In order to participate, fans from around the world can do the following: Download the Free GoldRun app from the iTunes App Store http://itunes.apple.com/us/app/goldrun/id396800792?mt=8 or Google Play https://play.google.com/store/apps/details?id=com.goldrun.goldrun. The TDC goes to the winner of an annual matchup between two of France’s top domestic clubs. The match is between Ligue 1 champion Montpellier and French Cup Champion Olympique Lyonnais. The French Soccer League puts the event together. The LFP(Ligue de Football Professionnel) runs the 2 top divisions in France, Ligue 1 and 2. Ligue 1 has 79 broadcasters in the world, and covers more than 150 countries. This will be the fourth consecutive year that the TDC match will be contested outside of France, but the first time the match will be played in a country that is not French speaking. The French “Super Cup,” the annual beginning to the French soccer season, will be decided between the two clubs on Saturday, July 28 3:00 p.m. EDT at Red Bull Arena in Harrison, N.J. Tickets for this emotional battle for French soccer pride are on sale exclusively through TDC-NYC.com. According to a press release: “Sport today is all about fan engagement, and this partnership with Goldrun, a leader in augmented reality creation in the entertainment field, will give fans from around the world a chance to virtually hold and have fun with one of the great prizes in soccer, the French Cup,” said Chris Lencheski, CEO of Front Row Marketing Services, who is helping stage the match in NYC. After GoldRun has been downloaded to your phone/tablet, open the app and as required, sign in using Facebook or Twitter. Once signed in, select the Trophée des Champions “photobooth” from either the featured carousel or campaigns list. You will enter the virtual photobooth and immediately see instructions indicating how you can adjust and interact with the virtual content. Use the arrows to select different virtual items and feel free to flip your device horizontally to better frame your photo. For devices with a front-facing camera, you can activate this by pressing the cam-flip button in the upper right corner. The blue camera icon button will capture your photo. After capturing a photo, select the sharing option – Facebook, Twitter or Email. You will be able to preview your image before sharing and modify the text as you please. After sharing, you will be able to enter the contest. Simply click the continue button, fill in the required information, and press submit. Participation for contest subject to listed rules. After receiving a confirmation for your entry submission, you can press the back button to take and share more photos. 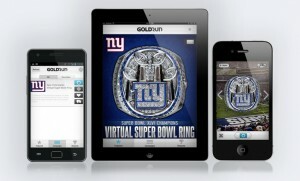 While this is an International AR first, the Social Media pioneering N.Y. Giants of the NFL, implemented the Goldrun App last Spring allowing their passionate GMen fans to have the experience of virtually trying on the team’s Super Bowl rings and trophy, while capturing and sharing those priceless moments with a digital photo on SM and their website. GoldRun is an Augmented Reality platform that transforms traditional digital media placements into immersive and immediately shareable brand-consumer engagements: GPS-Linked Virtual Photobooths. Users share their branded AR photos and accompanying messages on various social networks to earn rewards including discounts & vouchers, instant win prizes, access to exclusive media and the ability to advance order products. See web site campaigns at http://goldrungo.com/campaigns/ including Nike, Ford and Airwalk. Social Media: http://twitter.com/#!/GoldRun and http://www.facebook.com/GoldRun. Front Row Marketing Services®, a Comcast-Spectacor subsidiary headquartered in Philadelphia, Pennsylvania, and its sister company Front Row Analytics®, a proprietary sponsorship evaluation company, operate on a global to local platform in sports, entertainment, stadia, venues, consumer engagement and municipalities with divisions in the specific practices of College Rights, Municipal Rights, Digital Film and TV Rights, Venue and Team Rights and Social Media. We are a collection of veteran sports and entertainment executives operating on four continents with offices in 35+ cities whose portfolio of clients, present and past, stretches from professional sports teams in the NFL (Seattle Seahawks, Philadelphia Eagles, Houston Texans), MLB(Pittsburgh Pirates, Kansas City Royals), NHL(Philadelphia Flyers), NBA (Philadelphia 76ers, Orlando Magic, New Jersey Nets, Detroit Pistons), MLS(Seattle Sounders, Philadelphia Union), AFL(Philadelphia Soul) and AHL (Abbotsford Heat, Portland Pirates, Adirondack Phantoms, Hershey Bears); to venues (Wells Fargo Center, XFINITY Live! Philadelphia, The Greek Theatre, Singapore Sports Hub, Iowa Events Center, Budweiser Events Center, Miami Beach Convention Center, Rose Garden); to motorsports (Sam Schmidt Motorsports, Pocono Raceway, Dover Motorsports); to golf (PGA, LPGA); and to college (Temple University, University of South Carolina, Saint Cloud State University, Drexel University, James Madison University, Colonial Athletic Association). More information can be found at http://www.frontrow-marketing.com/, http://www.comcast-spectacor.com/, http://twitter.com/FRMktgSvs and http://www.linkedin.com/company/front-row-marketing-services. 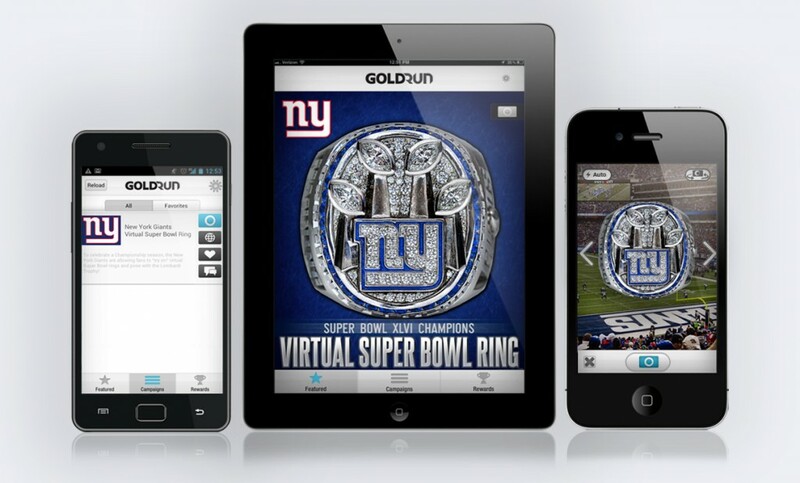 Augmented reality is indeed a cutting edge technology that Goldrun’s innovative app allows sports teams and brands the chance to share their historical hardware with fans, giving them virtual engagement time, and the option to share images via social media hubs. Progressive companies such as FRMS are helping to monetize AR campaigns which is smart sportsbiz. Sports Businesses such as the LFP, the NY Giants and Nike, use AR to promote their business agendas while increasing fan engagement. This sports technology application is a win-win for all parties. Have a good time with the sharing TDC AR App digital fun and earning your rewards.